Note: The author was a guest of Discovery Parks – Forster. However, all opinions are entirely her own. Forster-Tuncurry is an idyllic spot to head for a quick getaway from Sydney, whether a long-ish weekend or a relaxing week-long break. At 3.5 hours from the centre of Sydney, it’s not too long a drive, but just far enough to really escape the city, especially to plenty of almost empty beaches. 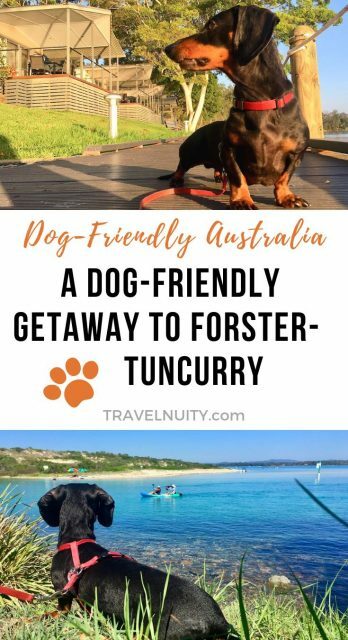 And if you’re wanting to bring your dog along, I’ve got all the tips that you need to have a fantastic dog-friendly getaway in the twin towns of Forster and Tuncurry. 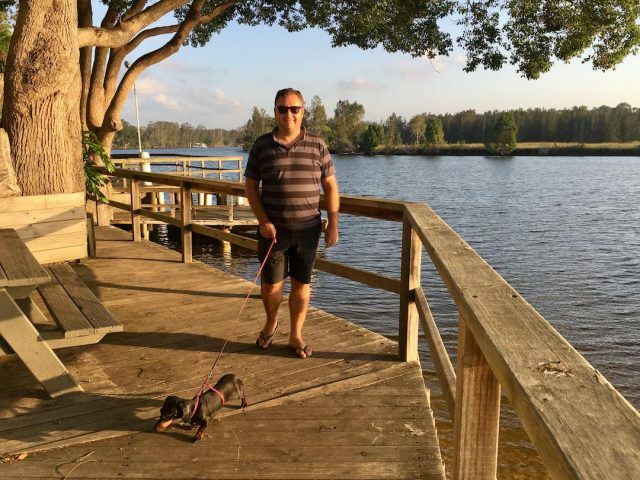 During my visit to Forster-Tuncurry, I stayed at Discovery Parks – Forster. 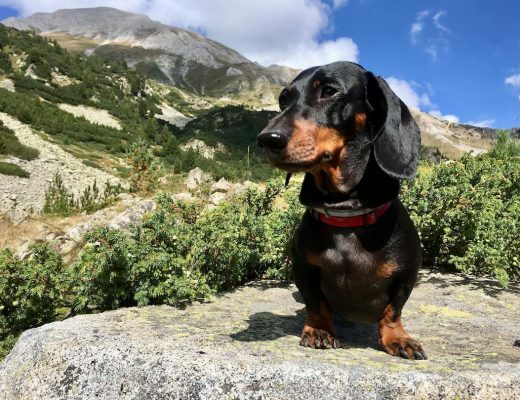 At this top-notch caravan park, it’s not only people bringing along their own tent or caravan that are permitted to have a dog, like at the majority of parks. Dogs are also permitted to stay in many of the cabins. On the Discovery Park website, it’s clearly listed for each type of cabin whether pets are permitted, along with other essential details such as the number of beds and what’s supplied. Pets are even permitted to stay in the Deluxe Riverfront cabins. 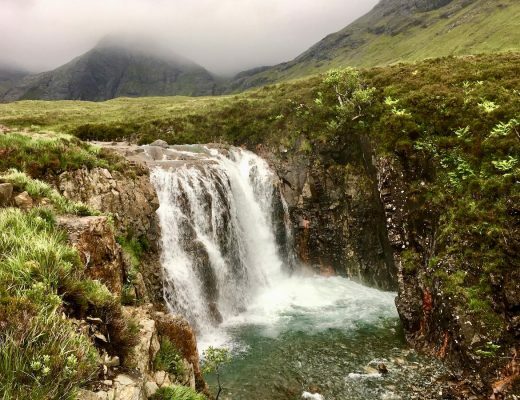 Perfect for those of us who aren’t partial to roughing it! Our Deluxe Riverfront cabin was similar inside to a high-end hotel or holiday apartment. Everything was new and modern. 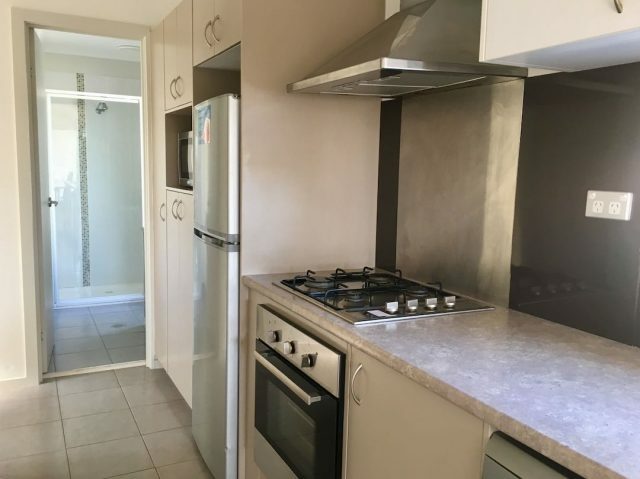 Particularly welcome was the full kitchen, including an oven and cooktop, microwave, full-size fridge and dishwasher. There’s a queen-size bed in the main bedroom, plus an additional bedroom with a pair of bunkbeds, perfect for kids. 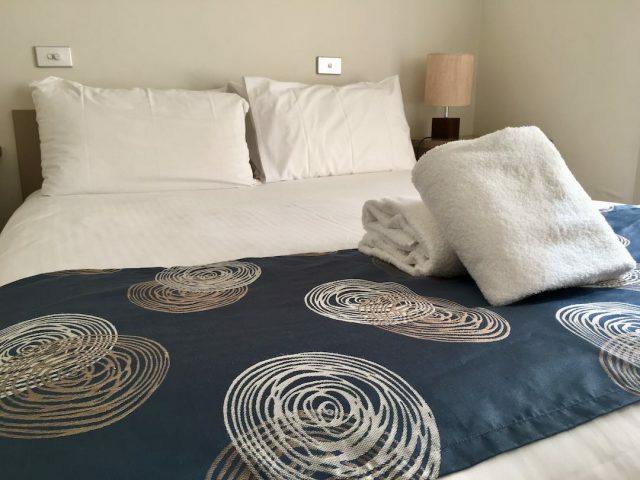 Linen and towels are included, along with toiletries in the spotless bathroom. But best of all is the large balcony out the front, looking directly onto the river. 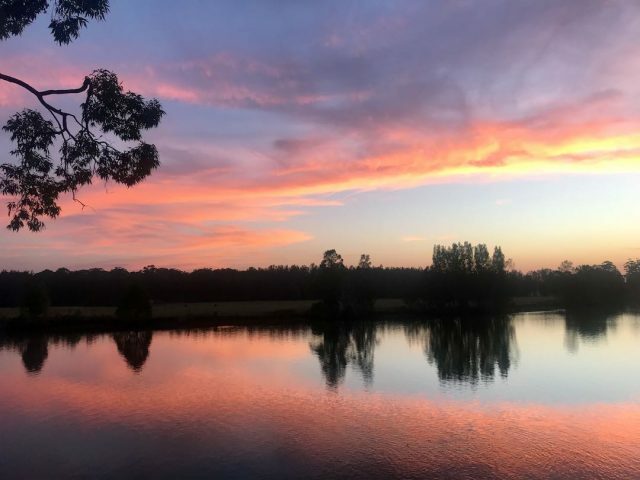 It’s the perfect spot to relax any time of day, but particularly beautiful each evening at sunset, kookaburras laughing from across the river. Other inclusions are reverse cycle air-conditioning and a TV with DVD player. Our dog, Schnitzel, was particularly intrigued by the “water dragons” sunning themselves along the riverbank in the afternoon. The boardwalk along the river was also the perfect place to take him for a walk, before heading down to the off-leash dog area at the other end of the park. 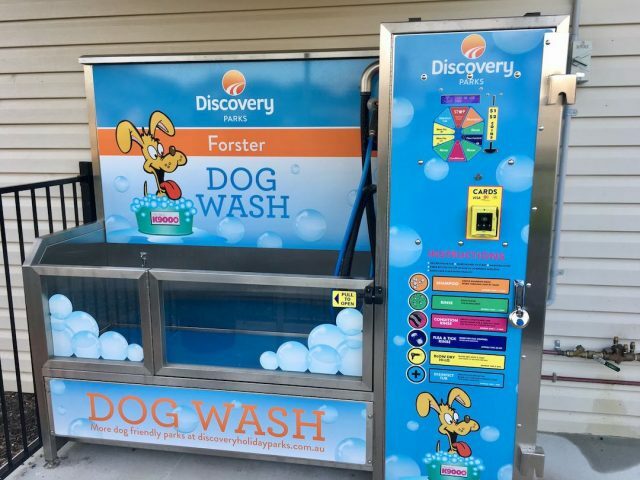 Also onsite is a self-service dog-wash, perfect for if your dog gets muddy or sandy during their holiday. If you’re planning on bringing your dog along, note that there are some rules. One dog per family is permitted, with possible management approval for a second dog. 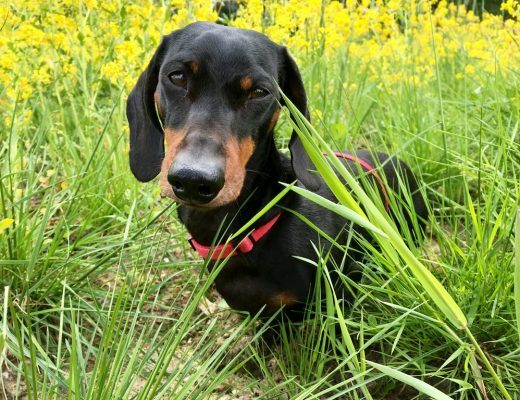 Dogs should be registered, microchipped and vaccinated, and not be left unattended at any time. 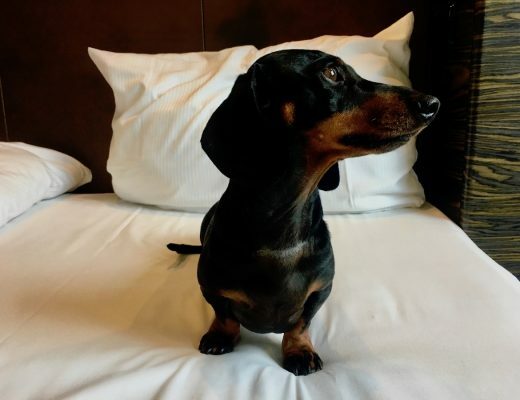 With cabins, dogs are permitted to sleep inside at night on their own bedding, but need to be kept out of the carpeted bedrooms and off the furniture. 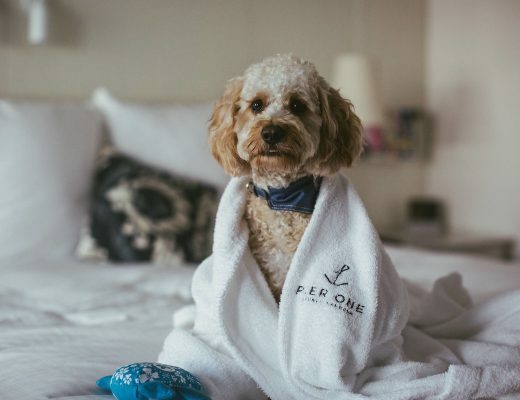 An additional $15/night fee is also charged per dog for cabins. Dogs are permitted year-round. 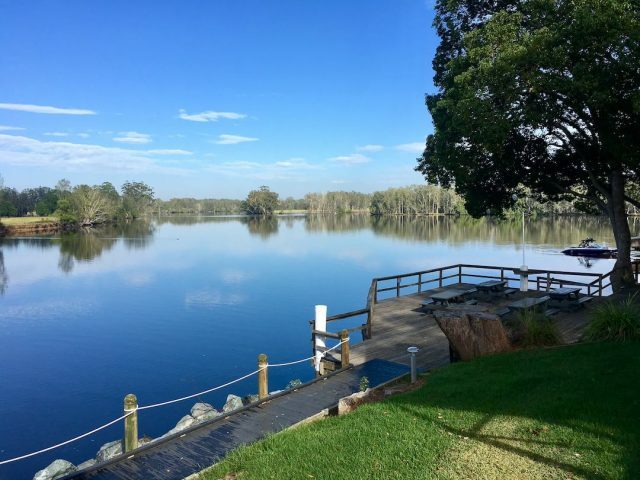 Discovery Parks – Forster is located inland from Forster-Tuncurry, on the river, but is just a 10 minute drive from plenty of dog-friendly beaches. 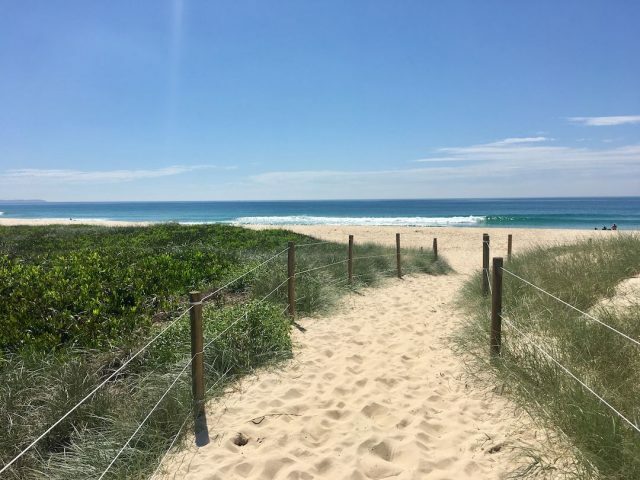 My top pick is Nine Mile Beach in Tuncurry. 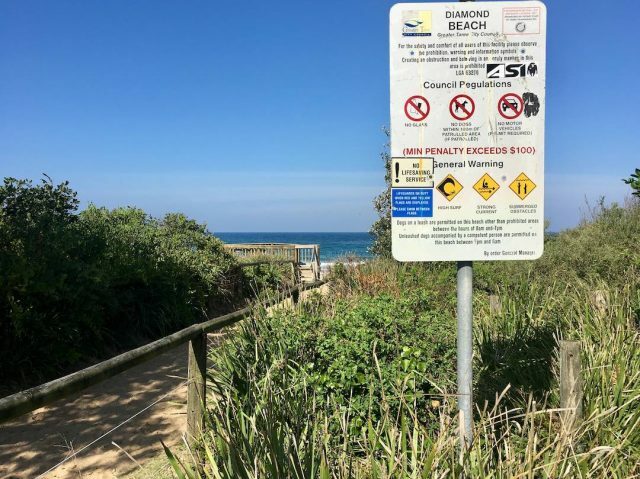 The southernmost section of the beach only permits dogs on leashes from 5-9am and 5-8pm, but head north of the 4WD access road (just after the Beach Street Reserve dog park), and the beach is off-leash from dawn to dusk. Be aware that the beach is unpatrolled and can be rough, so is not ideal for swimming, at least unexperienced swimmers. Also keep away from the path that 4WDs take along the beach. 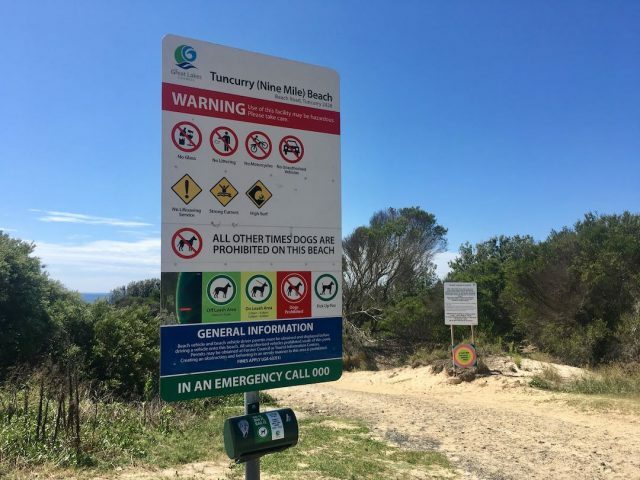 There’s also additional dog-friendly beaches if you head north to Hallidays Point. Dogs are allowed on all local beaches, except for near patrolled areas. They are meant to be on-leash between 8am and 7pm, but we spotted plenty of locals ignoring this rule. I recommend heading to Diamond Beach, parking at the end of Diamond Drive. There’s a handy dog water bowl at the parking area, plus a shower for rinsing off afterwards. Another option right in Forster, if you’re happy to visit during the early morning or evening, is One Mile Beach. Dogs are permitted on-leash on the southern end and off-leash on the northern end. However, they are only permitted in both sections between 5-9am and 5-8pm. 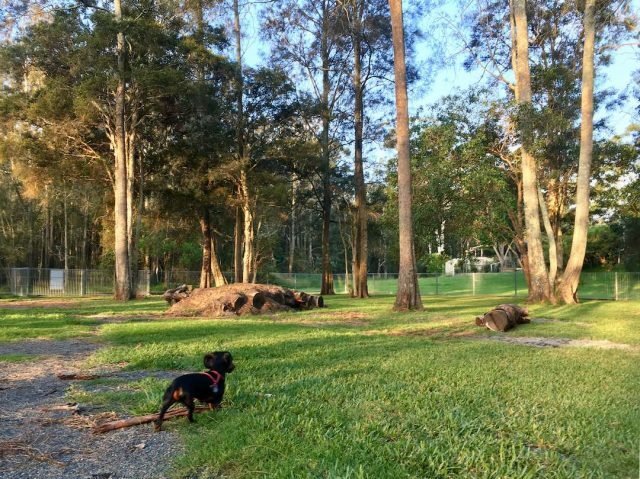 One of the great things about staying at Discovery Parks – Forster is that there is an off-leash dog area on-site, fully fenced. But there’s also other off-leash dog parks available in the area. The top option is the Beach Street Reserve in Tuncurry. This park just near the off-leash dog beach is fenced and even has a dog agility course. During the day it’s quiet but I’m sure there are plenty of other dogs for your pup to hang out with in the evening. Another option is Pipers Bay in Forster, fronting onto the lake. The northern end of the park allows dogs off-leash between 6am and 8pm. 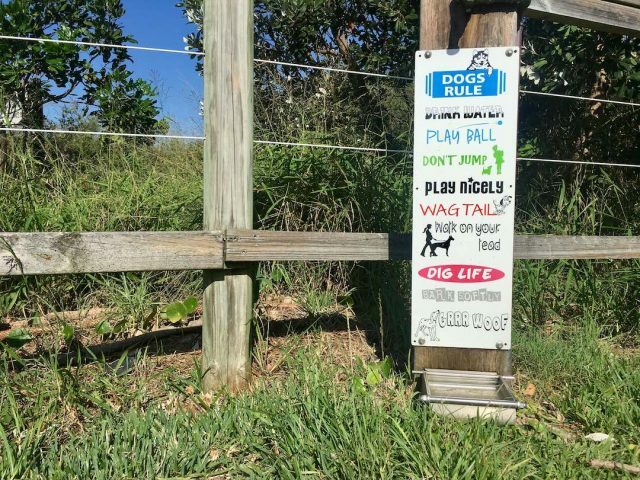 For more details about dog rules and off-leash areas in the Forster-Tuncurry area, check out the council website. 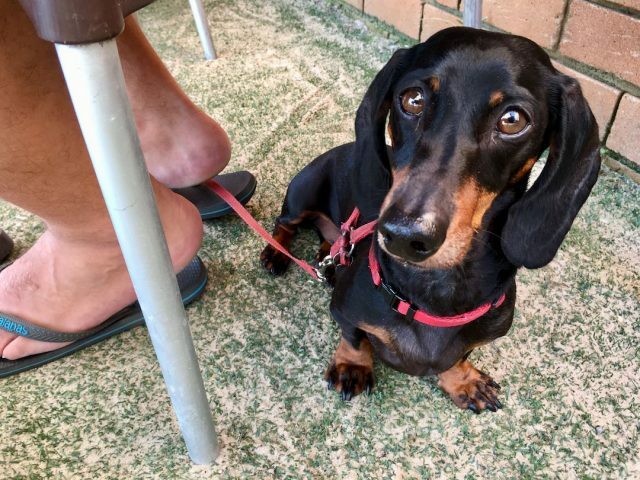 With many cafes in Forster-Tuncurry offering outdoor seating in the sunshine, there’s plenty of dog-friendly options. 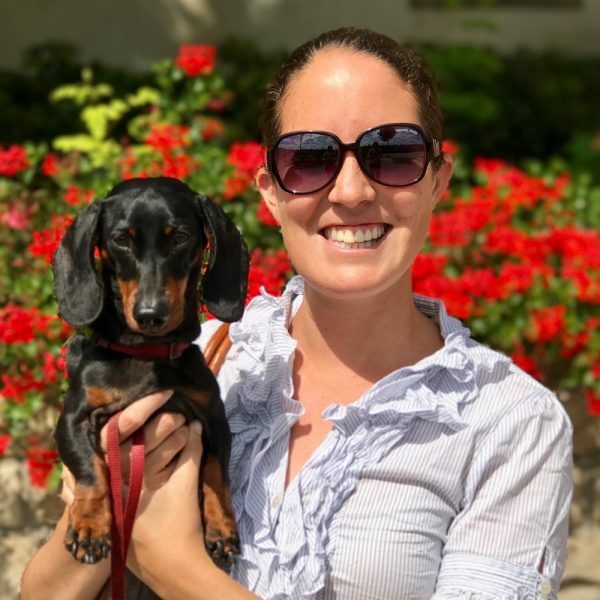 Note that you should always get the permission of the operator first (as some outdoor areas still may not permit dogs), plus your dog should be on a leash, not fed and kept on the ground. 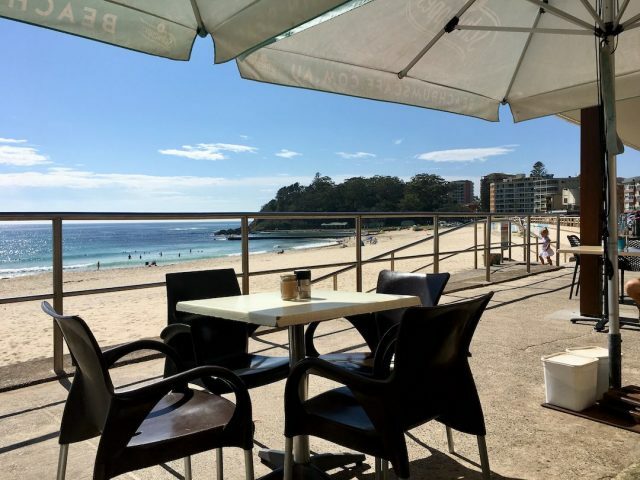 My top recommendation is Beach Bums Cafe, right on the main beach in Forster. 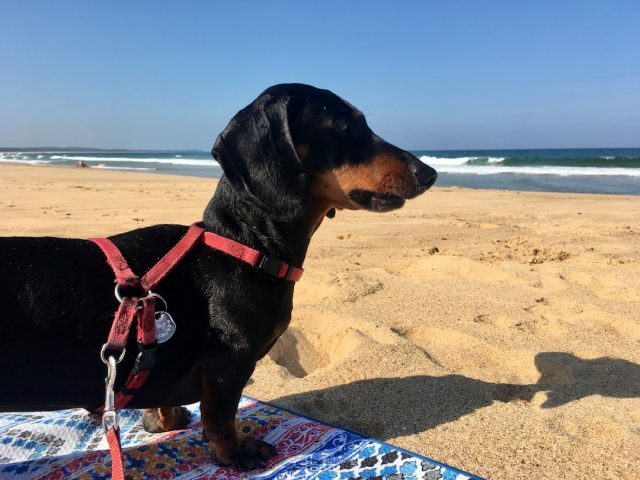 While dogs aren’t allowed onto the sand of this beach, everyone can enjoy the beautiful view across the beach to the baths on a sunny day. Nearly all the seating is outdoors, and a couple of dog water bowls are provided. 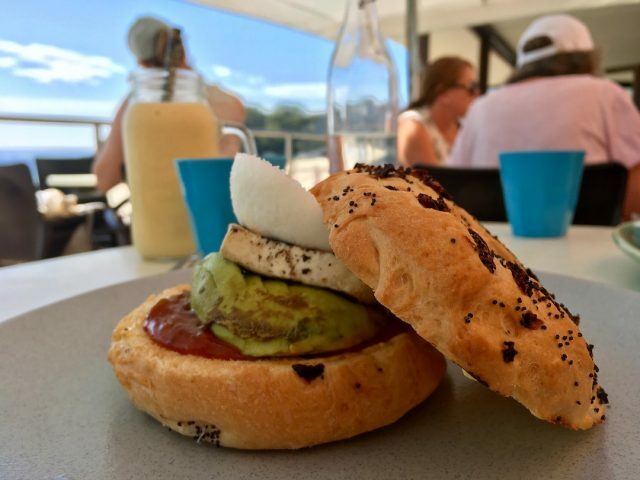 We had a delicious brunch at Beach Bums; I particularly recommend the haloumi and avocado breakfast burger! Later in the day popular options included fish’n’chips and burgers. 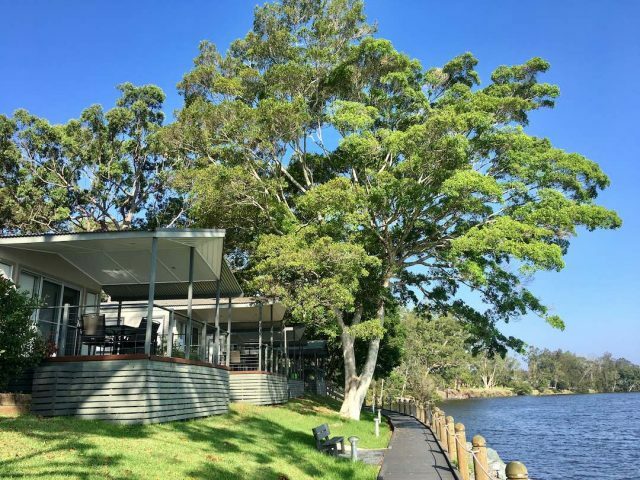 Back at Discovery Parks – Forster, there is also an on-site cafe, Rivz Cafe, that is open for breakfast and lunch most days, plus dinner on Saturday and Sunday nights. We sampled the breakfast and it was delicious and good-value! 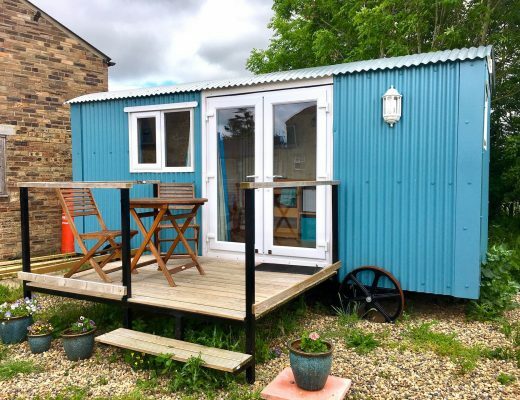 Other dining options include utilising the on-site BBQs to cook up lunch or dinner, then dine on the balcony of your accommodation – no permission from anyone required! There’s also a friendly sausage sizzle raising money for various charities every Tuesday night. While in Forster-Tuncurry, don’t miss out on trying some of the fabulous oysters from Wallis Lake. We bought a take-away tray from Hamiltons Oysters in Tuncurry and enjoyed them while watching the sun set that evening. Take a 30 minute drive to the winery at Great Lakes Paddocks, just off the Pacific Highway. 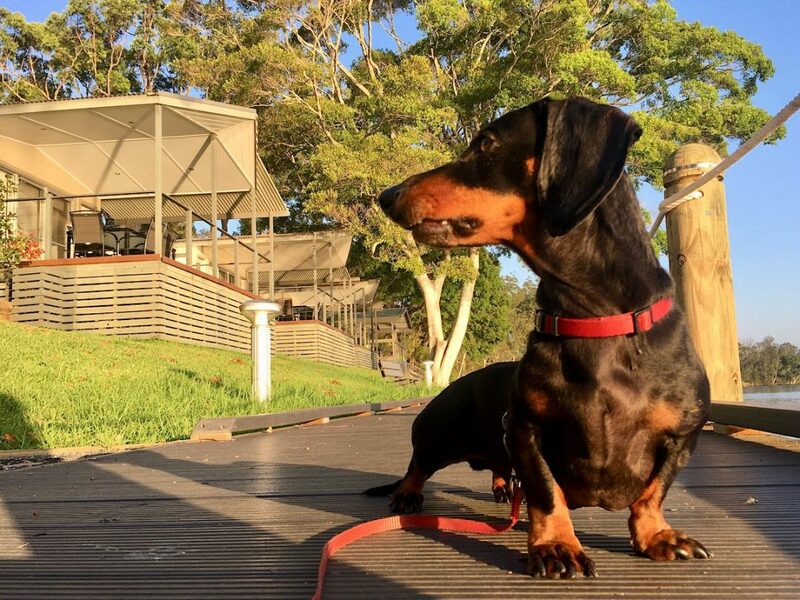 The winery is open from Thursday to Monday and is family-friendly, including dogs. A range of local produce including beef is also available, plus grazing plates to enjoy with a glass of wine. 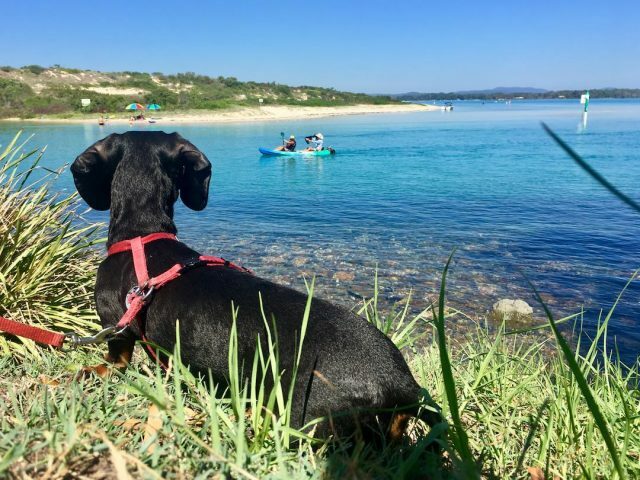 Hire a stand-up paddleboard (SUP) and head out for a paddle with your pup. SUP hire is available at Discovery Parks – Forster to take out on the tranquil river. Alternatively, head to Waterline Boat House on Wallis Lake in Forster. I recommend having a lifejacket for your dog.